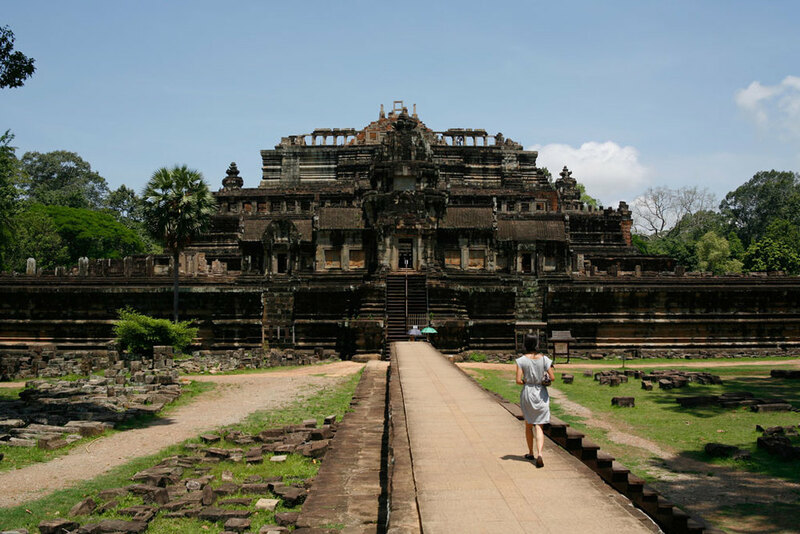 A five-day temple run through Siem Reap that includes tours of Angkor Wat, Roluos, Bayon, Banteay Srei and Banteay Samre, plus a boat ride on the Tonle Sap. 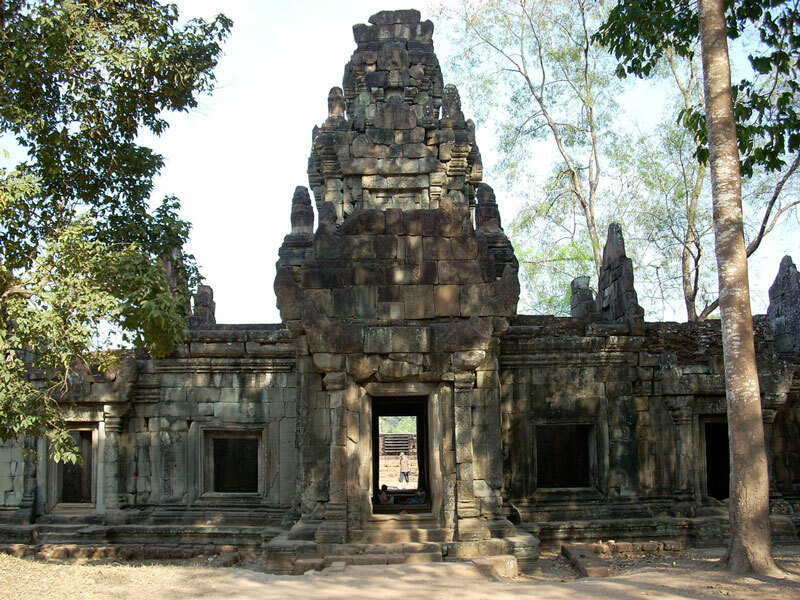 The temples of Angkor built in the early 12th century represent the epitome of classical Khmer architecture. 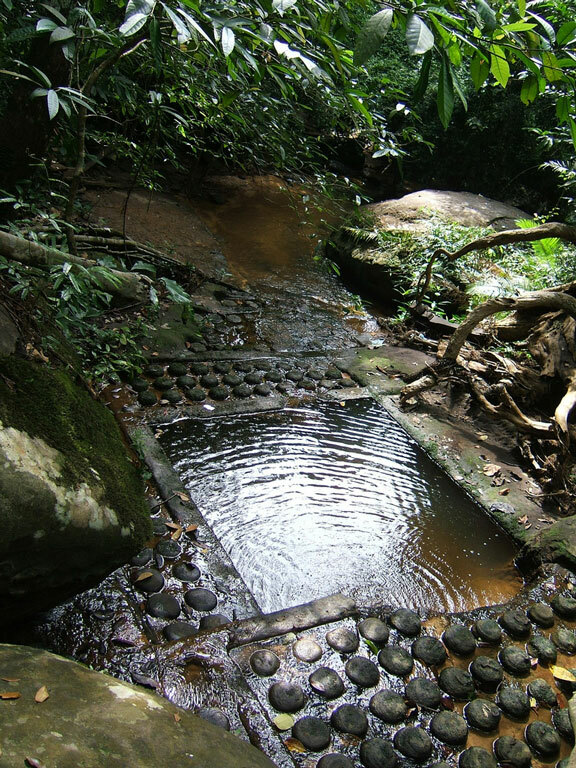 It was in the 1860s that the jungle ruins were made famous to the western world by French explorer Henri Mouhot. It takes several days to visit all the temple ruins. 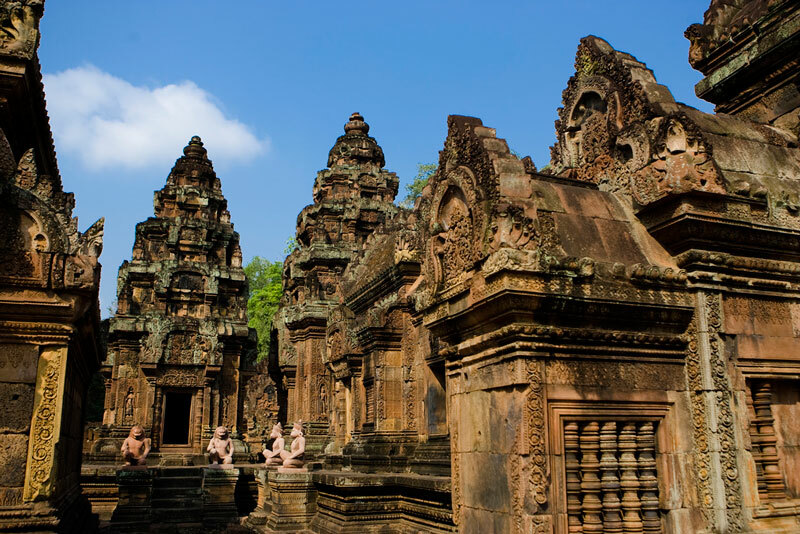 Some of the main temple sites included in this itinerary are Angkor Wat, Angkor Thom, Ta Prohm, Banteay Srei and Banteay Samre. If you intend to go off the usual paths, it's best to have your local guide accompany you. Sample the multi-cuisine: Vietnamese, Chinese, Thai, Indian and Continental. Shopping is an exciting experience and the boat ride on Tonle Sap with the floating village is not to be missed. Arrive into Siem Reap, northwestern Cambodia. Meet your car and driver and transfer from the airport to your hotel. Overnight Siem Reap. Breakfast at the hotel. Meet your guide. 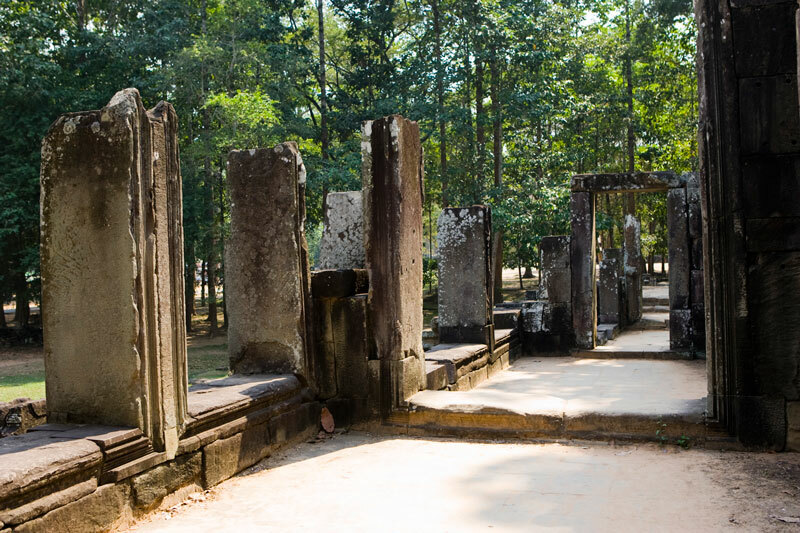 Take a morning tour to Roluos and its ancient temples including Bakong, the first temple mountain of Angkor; Preah Ko, meaning 'sacred bull', built in 879 A.D. and the Lolei temple. Afternoon tour exploring Angkor Wat. The juxtaposition of Buddhist shrines, Shiva temples and entire scenes from the Ramayana and Mahabharata carved on the temple walls is extremely captivating. Watch sunset over Angkor Wat from the hill of Phnom Bakheng. Overnight Siem Reap. Note: Please carry 2 passport sized pictures for the Angkor Wat photo pass. Watch the sunrise at Angkor Wat. Return to your hotel for breakfast. 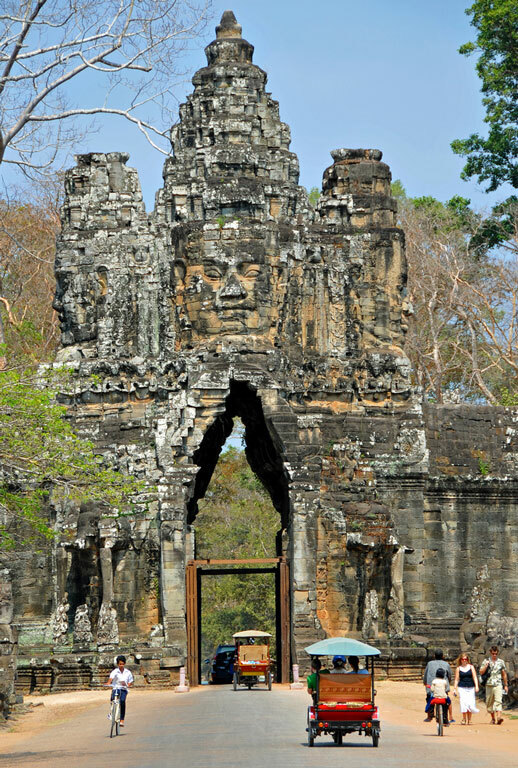 Then proceed on a tour to Angkor Thom city and the huge Bayon temple brooding at its centre. 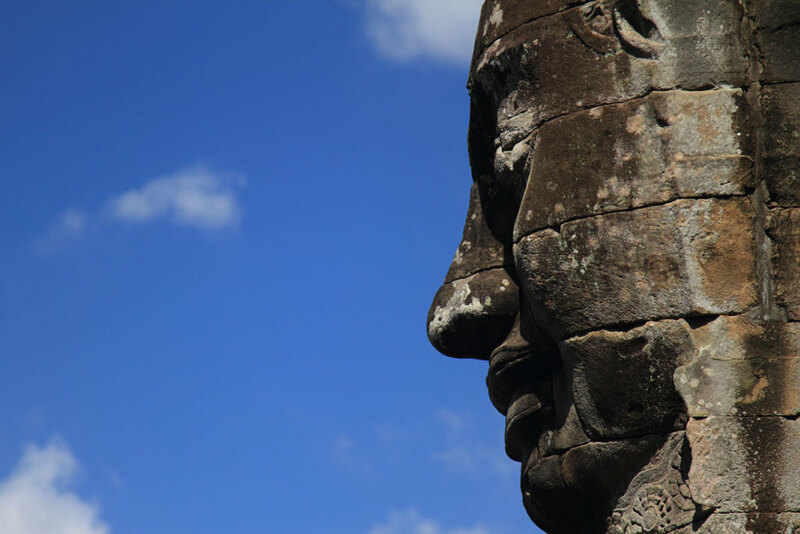 Bayon is filled with engrossing bas-reliefs and over 200 massive faces carved on stone towers. An amazing (and pretty surreal) experience. Continue to the other temples of Angkor Thom- Baphuon and Phimeanakas, and the Terraces of the Elephants and the Leper King. Each of these enthralling spaces has a drama all its own. 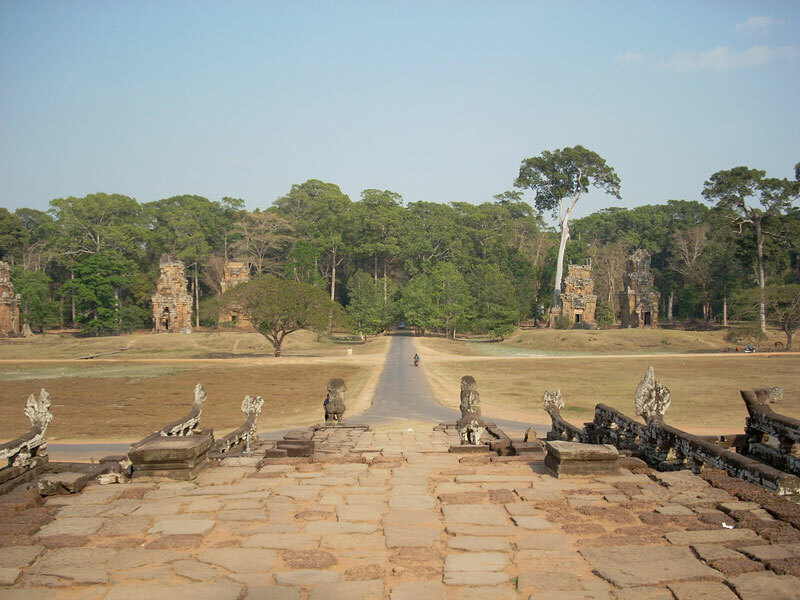 In the afternoon, you'll get the grand circuit tour including Preah Khan, Neak Pean and East Mebon temples. Overnight Siem Reap. Note: There is a small local market next to the Ta Prohm hotel and you can find some really interesting bargains here- hammocks made of parachute nylon, tiny bronze statues of Shiva and Ganesh and some lovely silk sarongs. Breakfast at the hotel. 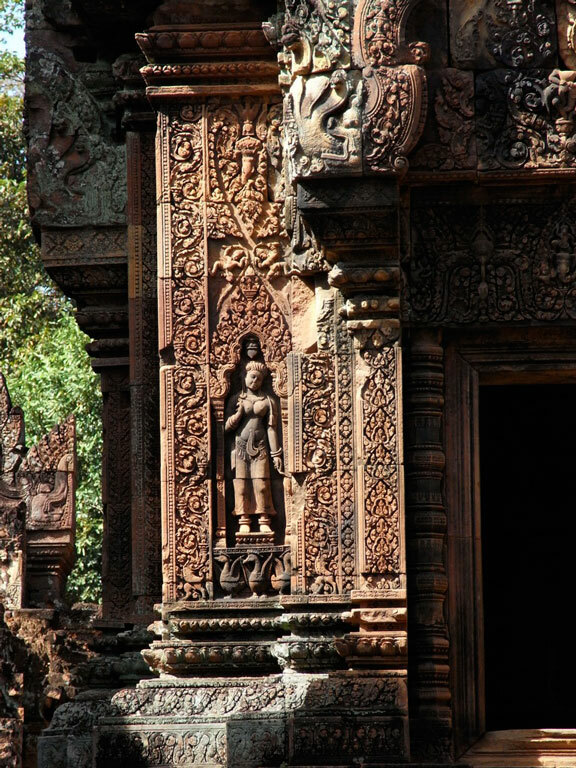 Then a morning tour to the Banteay Srei and Banteay Samre temples. These are built largely of red sandstone. 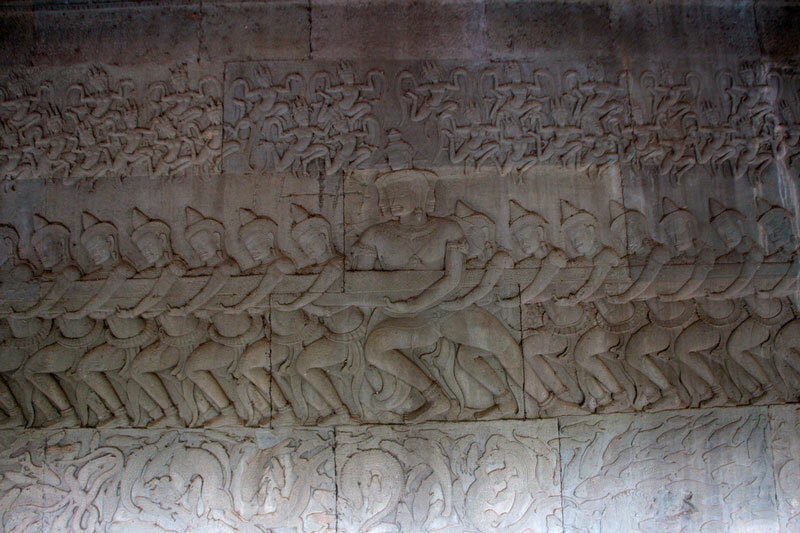 The carvings here are very different from the ones seen in the Angkor complex- much finer and immensely more detailed. There are some very interesting carvings of Shiva and Parvati on one of the temples. You might even catch an impromptu music performance by local musicians playing traditional Cambodian instruments. In the afternoon, take a boat ride on the Tonle Sap- a huge inland lake with its quaint floating villages and even a floating petrol station. The Tonle Sap is fed by a river that comes all the way from Phnom Penh, and you can occasionally see powerful motorboats that make the journey, packed to capacity, with many passengers perched precariously on the cabin roof! Overnight Siem Reap. Breakfast at the hotel. 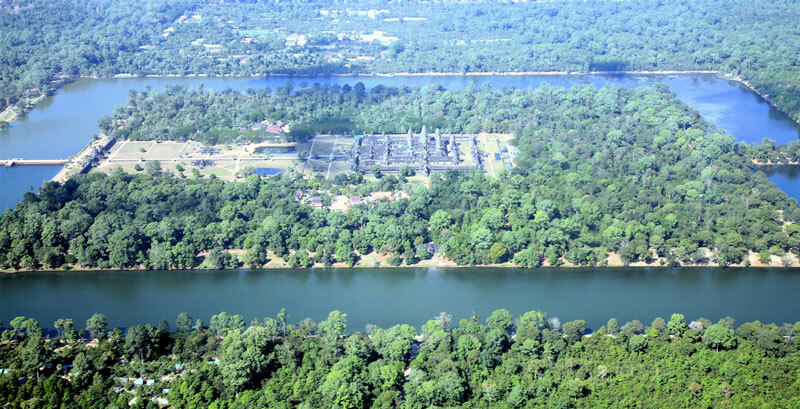 Then perhaps a last visit to Angkor. On the way back, visit Artisans D'Angkor, a center for traditional Cambodian handicrafts where you can watch the artisans at work. Return to your hotel. Check out and proceed to the airport. Ta Prohm is one of the must-see sites in Siem Reap located near Angkor Wat and Bayon. What makes it a truly remarkable sight is the way the roots of trees have wrapped themselves around the temples and are actually holding the monuments together while tearing them apart. 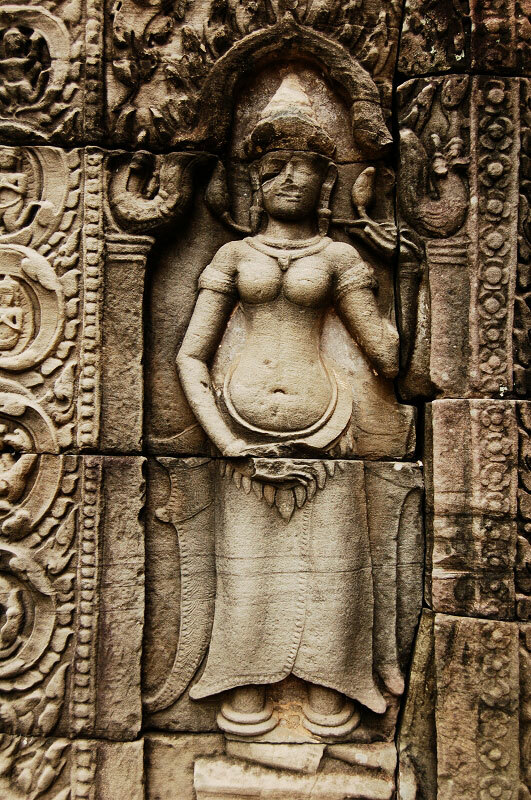 Ta Prohm was left unrestored for years and the wild, untamed energy of this temple complex is quite special.